Esplanade Park sits between the north and south esplanade in the city. It’s a popular picnic spot and meeting place for locals. During summer, the park hosts a range of events and concerts. If that’s not your thing, there are lots of high-end shops here to relieve you of your hard earned money. Senate Square is home to the oldest stone building in Helsinki; Serderholm House. The neoclassical buildings are the design of Carl Ludvig Engel. The buildings here are some of the most important in Helsinki; such as The University, Helsinki Cathedral and the National Library. The sports venue was designed and built for the summer games in 1940. Yet, due to the outbreak of war, the park wasn’t actually used until 1952. These days, although the capacity is smaller, the stadium is often used for events and concerts. The stadium has a hidden secret in that the tower, standing at 238 feet high, offers a spectacular view of the Helsinki landscape. This Evangelical Lutheran church is the most iconic building in the city. It’s definitely one of the most popular visitor attractions and it makes for a great photo! The brilliant white exterior and signature green dome ensure Helsinki Cathedral is the highlight of Senate Square. 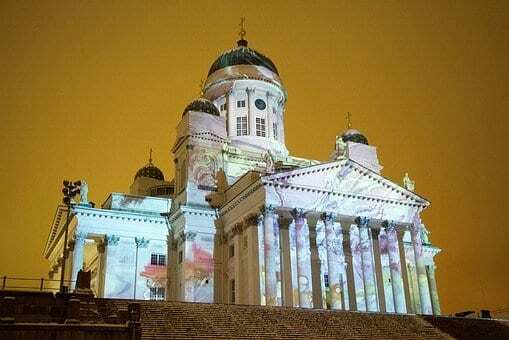 The cathedral is also beautiful when lit up at night and always tops the list of must-see sights in Helsinki. We were lucky enough to be able to experience the market while we were visiting Helsinki and it’s a great way to get to know the locals and pick up some souvenirs. The square sits right on the south harbour and is very popular in October when the herring sales start. It’s a great place to grab a coffee in one of the tented cafes and do a spot of people watching. This structure, made from Finnish wood, sits at the entrance to Kamppi mall. It represents a quiet space in one of the busiest parts of the city. Although it has ‘chapel’ in its name, the space is completely non-religious and no ceremonies are held here. It is simply a calm space to be enjoyed by anyone. Although Helsinki Cathedral gets the most attention, this was my favourite building in the city. The red brick building with the green and gold domes is the largest Orthodox church in Western Europe. Because of its location on a hill, it also offers great views across the city streets. It’s free to enter and is also beautiful inside. This wasn’t universally popular with locals when it was Bully in 1969, and you can see why when you consider its literally built from a massive piece of rock. However, its amazing design has made it one of the city’s most talked about attractions and it’s impressive inside and out. This is another abstract design that didn’t win many fans when it was first submitted as part of a design competition. The Monument, which is a tribute to Finnish composer, Jean Sibelius, comprises 600 hollow steel pipes. Located opposite the main Helsinki Central Station, the museum houses the largest classical art collection in Finland. The collection ranges from classical 18th-century art to modern pieces from the 20th century. Designed to repel unwanted advances from Russia, this fortress was built across 6 islands. These days, there’s far less threat from Finland’s neighbours, so the fortress is mostly a visitor attraction and space for locals to meet in the summer. The fortress is accessible via ferry from Market Square and is a 15-20 minute journey. What are your must-see sights in Helsinki? Awesome! Was thinking about Helsinki, maybe not in winter though….. that’s the only thing that puts me off more than the cost of beer! Ha! Yes, it was pretty pricey, even for coffee. We were on a layover on the way to South Korea, so we didn’t get too long to explore. It’s such a gorgeous city, though. I need to get back when we have more time.